Nabam Rebia on Tuesday lodged an FIR against one Tenzing Norbu for defaming his name in the recent cash-for-job scam in IMC. 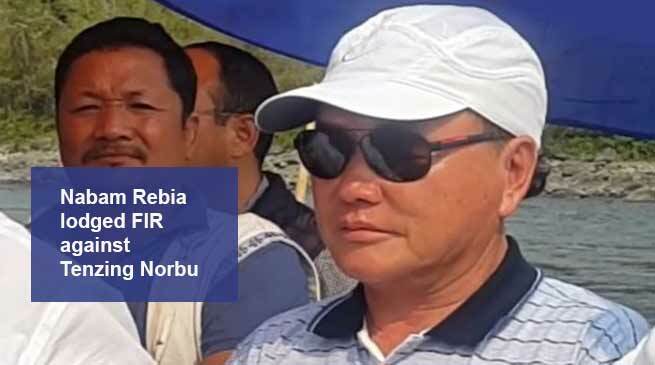 Minister Environment & Forest, Nabam Rebia on Tuesday lodged an FIR against one Tenzing Norbu for defaming his name in the recent cash-for-job scam in Itanagar Municipal Council (IMC). According to the FIR, Tenzing Norbu had uploaded an article in social media (Facebook) alleging Rebia along with MLA Techi Kaso, as the master mind behind the cash for job scam. Rebia said the allegation, posted in social media has damaged his reputation in the society and has put his integrity in question. He requested SP Itanagar Police to take action against the facebook account holder and book under appropriate section of the IT Act. The case of Cash for job is being investigated by the SIC and hope the truth will come out soon, Rebia said in the FIR. It must be mention here that earlier on Monday Local MLA Techi Kaso also had lodged an FIR against the same person on the same issue. Meanwhile the Capital SP M Harsha Vardhan when contacted said that complaint made by Minister Nabam Rebia and local MLA Techi Kaso are non cognizance offence of criminal defamation which need court permission for investigation. He have requested both of them to provide some details in this regard so that case will investigated through cyber crime cell. Sp added. i m very fond to know about state news.. and i think this plateform is the r8 place to seek better nd faster news updates. thank you. i appreciate ur news articles a lot..